I love the idea of hosting dinner parties, but the stress of putting one together usually stops me before a single invite goes out. Apparently I’ve been making it harder than it needs to be. By following a few simple guidelines and, surprisingly, thinking more like a chef, cooking for a group can be a calmful experience. “The truth is, having friends and family over for a shared meal doesn’t have to be a nerve-wracking endeavor,” says Peter Calley, executive chef and owner of Culinary Hedonism in San Diego. In addition to offering catering and classes, Calley and his staff run a twice-monthly supper club where twelve guests are treated to an eight-course tasting menu featuring local, seasonal ingredients. While he doesn’t recommend the average home cook embark on an eight-course meal, Calley does believe many of his professional techniques can make your next dinner party a low-stress, memorable affair. 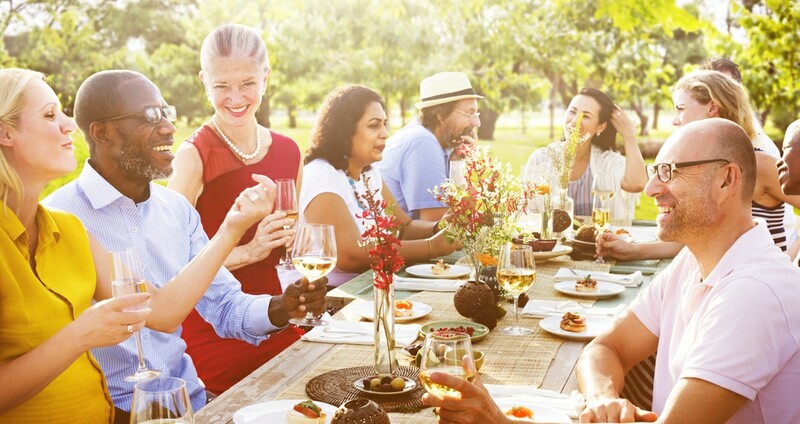 While your menu choices and the size of your house can influence things, there may be a sweet spot when it comes to how many guests to invite. “I think eight people is the magic number,” says Calley. “It’s small enough to encourage intimate conversation but large enough so that people never feel bored.” Plus, it’s easy to multiply most recipes for that number. You want to make it interesting but not too hard on you. “Four courses is a nice number—an appetizer or small spread during cocktail hour when your guests arrive, and then a traditional soup or salad course, entrée and dessert,” suggests Calley. One of the best ways to keep stress at bay is to map out the evening ahead of time. Of course, doing your shopping a few days before the party is a great idea, but you should also take an early inventory of your plates, glasses, etc., and create a game plan for your courses. “Make a list, and order how and when you plan on making each part,” says Calley, who recommends choosing dishes you have prepared before so you know what they should look and taste like. “If you are following a new recipe, read it multiple times before you begin. Understand what the recipe is asking you to do and when to do it,” he says. Labor-intensive drinks and appetizers will keep you from mingling with your guests as they arrive. Make it easy on yourself by serving wine and beer—you can even consider a self-pour station. “If you’d like to offer a cocktail, choose something you can mix up beforehand and pour for your guests over ice and serve with a garnish,” suggests Calley. Think sangria or margaritas. As far as appetizers go, Calley stands by the classics. “A charcuterie board with an assortment of meats, cheeses, fruit and crudités is always fashionable and appeals to a wide array of tastes. Guests can select what they want and mingle with each other before dinner begins. Make sure you offer a small assortment of bread, crackers and gluten-free options,” he says. “Prep the heck out of everything,” says Calley, who recommends having everything ready BEFORE you begin cooking—even placing all tools you’ll need within reach to help you execute easily. “I like to use sheet pans to organize my ingredients by dish,” he says. And of course, clean as you go. If you want to make it really easy on yourself the night of the party, choose dishes you can make some or all of a night or two before the event and then reheat. “Stews, braises and many sauces can be made ahead of time and will taste better if they have time for the flavors to meld. Many classic desserts can also be made in advance, such as panna cotta, pots de crème, pies, cakes, tarts and ice cream,” says Calley. Check out two recent Supper Club recipes from Culinary Hedonism: Sautéed Chanterelles and Chard with Pickled Blackberries, and Charred Corn on the Cob with Marigold Honey Butter, Smoked Paprika, Chives and Mizithra Cheese.